A conservation planning framework that applies what we know about birds as indicators of forest structure and composition can inform landscape level planning and stand level restoration. Such planning strives to achieve restoration goals that benefit entire forests and the animals that inhabit them. We selected focal bird species that are representative of old growth forest conditions, and then, within the focal species framework we included the needs of priority wildlife and plant species. By cross-walking a focal and priority species approach, we identify current and desired conditions, recommend prescription components, and implement monitoring to measure treatment effectiveness. Klamath Bird Observatory has partnered with the Stillaguamish Tribe of Indians, Sauk-Suiattle Indian Tribe, and Puget Sound Bird Observatory to form a technical advisory team which is working side by side with the Regional Forest Service Avian Conservation Program Manager and USDA Forest Service Mt. Baker-Snoqualmie National Forest staff to inform restoration planning. Collectively, this team has integrated focal species needs into planning for the South Fork Stillaguamish Vegetation Project and designed a robust monitoring strategy to measure ecological outcomes. This vegetation project is occurring in densely stocked Late Successional Reserves (areas set aside to provide old growth habitat). The Forest has identified ~3000 acres where commercial thinning of trees <80 years of age would be both feasible and beneficial to old growth dependent species within a project area of 65,000 acres. 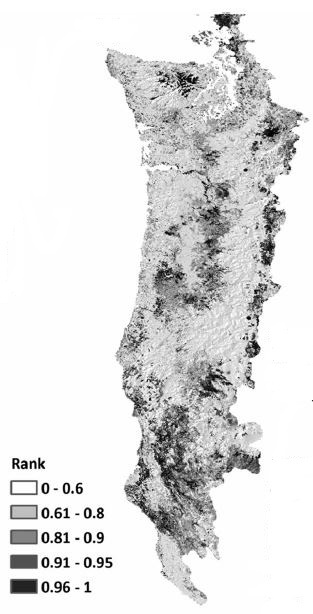 Restoration goals are to promote stand development and characteristics of old forests, e.g. broadleaf plants, structural diversity, standing dead trees, and coarse woody debris on the ground. Thus, thinning is designed to promote tree species diversity, structural complexity, and understory cover at the treatment site and contribute to landscape scale goals for Late Successional Reserve habitat diversity over the long-term. KBO staff discuss current forest conditions with Forest Service foresters and biologists and additional partners working together to design this restoration project. 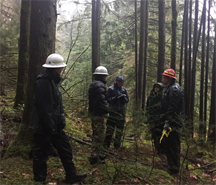 At the onset of the partnership, the technical advisory team looked at areas that the Forest had assessed for potential restoration and identified the upper South Fork Stillaguamish drainage as a conservation priority. The area is designated as a Late Successional Reserve and is currently comprised largely of second growth stands that are adjacent to large contiguous stands of mature and old growth forest. Forest restoration treatments that accelerate the development of older forest characteristics will have added value in this landscape by reducing fragmentation and creating larger blocks of priority forest age structure. Klamath Bird Observatory applied avian climate models and determined that this area is a good candidate for climate smart restoration — that is, the desired conditions align with what climate models project for the area over the next 50-100 years. The upper South Fork Stillaguamish drainage also lends itself well to monitoring — it has good road access, a reasonable number of replicates for treatment and control stands with similar vegetation and age structure, and is a reasonable size to implement both stand and landscape level monitoring. The technical advisory team worked with the forest planning team to inform restoration planning, including stand level treatment prescriptions. Klamath Bird Observatory, working closely with the Regional Forest Service Avian Conservation Program Manager, applied focal species information from applicable Partners in Flight conservation plans. We identified current and desired conditions based on a suite of focal landbird species indicative of specific stand attributes, structure, and condition. Tribal partners identified additional plant and wildlife species that are management and/or cultural priorities in the planning area. Collectively, working within the sideboards of the Forest Service environmental assessment, we established measurable habitat objectives to achieve desired habitat conditions based on the habitat needs of focal species. Because focal species informed planning, we applied the same approach to develop a short and long term monitoring strategy that will measure treatment effectiveness and inform adaptive management. Klamath Bird Observatory worked with the Stillaguamish Tribe of Indians to design site and landscape scale monitoring. By measuring changes in bird communities and vegetation we will be able to assess whether restoration treatments have the desired result, and because a suite of birds serve as indicators of various forest components, we will be able to assess whether the forest is on a trajectory toward older forest conditions over the next 20-50 years. The Stillaguamish Tribe of Indians in partnership with the Puget Sound Bird Observatory are completing bird and vegetation monitoring, in part, through citizen science. Achieving long-term monitoring goals is dependent on partnerships, and this project provides a great example of how various organizations can bring expertise to the table to accomplish goals in a cost effective manner. Data are being contributed to Avian Knowledge Northwest, a regional node of the Avian Knowledge Network and thus, also contributing to this larger avian data collaboration with the potential to inform regional management challenges and conservation planning at even broader scales. Density-based zonation analysis produced high rankings that were concentrated in the southwest of the study area in the Klamath-Siskiyou Bioregion. A new paper published in the journal Conservation Biology presents results from a novel conservation planning approach. This approach uses detailed data that predict the density of bird species across landscapes, as opposed to probability of occurrence models more typically used in conservation planning. These density-based models are better suited for identifying the highest priority conservation areas. The models were used to identify priority conservation areas in the Pacific Northwest. The results show a concentration of high ranking conservation areas in the Klamath-Siskiyou Bioregion. The Klamath-Siskiyou Bioregion is recognized as an area of great biological diversity and as an important area for avian diversity. This new paper further demonstrates that the Klamath-Siskiyou Bioregion stands out as an important area for conservation focus. This newly released Conservation Biology paper, titled Improving Effectiveness of Systematic Conservation Planning with Density Data represents collaboration among scientists from Klamath Bird Observatory, American Bird Conservancy, and Point Blue Conservation Science and was made possible with funding from the North Pacific Landscape Conservation Cooperative and data contributed from many Avian Knowledge Network partners. A recent study published in the journal Conservation Biology makes a strong case for a new approach to conservation planning that uses much more robust data sets in order to better protect birds, plants, and animals. The concept is fairly simple, but won’t work unless scientists can agree to share data across studies. To illustrate this point, a research collaboration including authors from Point Blue, American Bird Conservancy, and Klamath Bird Observatory encouraged partners to make their detailed bird observation data accessible through the Avian Knowledge Network. Members of the Oregon/Washington Partners in Flight bird conservation community rallied to the call and over 900,000 new bird observations from 23 different studies were contributed to the Avian Knowledge Network through the Avian Knowledge Northwest node. These data were then combined with bird data from the California Avian Data Center and used to develop both presence/absence species distribution models and density models covering coastal Northern California, Oregon and Washington for 26 species of land birds representing four different habitat types. These models are freely available as part of the Pacific Northwest Climate Change Avian Vulnerability Tool available at Avian Knowledge Northwest. To demonstrate the value of this large and detailed dataset, the Point Blue, American Bird Conservancy, and Klamath Bird Observatory researchers mapped conservation priority areas based on both the presence/absence and density models and compared the estimated population size protected in priority areas mapped using each method. “As expected, we found that the prioritizations based on count data protected more individuals of each species than the prioritizations based on presence/absence data in the areas of highest conservation priority,” Veloz said. This study was funded by the North Pacific Landscape Conservation Cooperative. Full citation: Veloz, S., Salas, L., Altman, B., Alexander, J., Jongsomjit, D., Elliott, N., Ballard, G. 2015. Improving effectiveness of systematic conservation planning with density data. Conservation Biology. http://onlinelibrary.wiley.com/doi/10.1111/cobi.12499/abstract. This news release adapted from Point Blue Conservation Science June 10, 2015 Press Release.